Dendritic cells (DCs) do not represent a single uniform population, but rather display a considerable degree of heterogeneity. One of the challenges in DC research and use of these cells as therapeutic targets will be to better understand the specific biology associated with the different DC subtypes. Subtypes of DCs can be identified according to their localization, phenotype, and immune function. 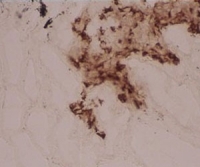 Langerhans cells represent the DCs of epidermis and stratified mucosal epithelia and are characterized by their expression of Langerin/CD207. The class 6 semaphorin SEMA 6A further defines an activation status of Langerhans cells. DCs of the dermis or the lamina propria of mucosae (interstitial DCs) constitute more diverse populations, characterized by the expression of DC-SIGN/CD209 (DC-SIGN-like) in humans. Positive identification of such DCs is comforted by other markers such as DEC205/CD205, CD1a (in humans only) and the coagulation factor FXIIIa. Other molecules expressed by interstitial DCs, or subsets thereof, include the macrophage mannose receptor (MMR/CD206) and the macrophage galactose lectin / asialoglycoprotein receptor (CD301) , DCIR / CLEC4A, and FDF03 / PILRA. Many features of interstitial DCs are shared by macrophages, a fact that illustrates the existence of a broad continuum between these two cell types. Both Langerhans cells and interstitial DCs are highly specialized in the capture (internalization / endocytosis) of exogenous antigens through various mechanisms. Following appropriate activation signals, cutaneous and mucosal DCs undergo a maturation sequence and migrate via lymphatic vessels into draining lymphoid tissue, where they can efficiently present processed antigen to specific T lymphocytes. However, it is unclear if different DCs that reach lymphoid tissue will intrinsically imprint their signature to the type or intensity of the immune response. Likewise, the comparative potential of these DC subtypes to induce a state of immune tolerance remains to be clarified. Interdigitating DCs, localized in the T cell areas of secondary lymphoid tissue, express the lysosome-associated marker CD208 / DC-LAMP, as well as the costimulatory molecules CD40, CD80, CD83, and CD54/ICAM1. By contrast, molecules such as the Ig superfamily member DORA are downregulated upon DC activation. A relatively recent, but highly important addition to the DC family is the plasmacytoid DC (pDC), also known as natural Interferon-Producing Cell (IPC). pDCs differ from the "conventional" DCs described above by a number of criteria. Phenotypically, pDC can be identified by their expression of BDCA2 (CD303), IL -3 receptor alpha chain (CD123) , and lack of CD11c, a feature of most other DCs. Neuropilin-1 is also expressed by pDCs, although not entirely restricted to this DC subtype. Mouse pDCs/IPCs display a cell -surface molecule recognized by monoclonal antibody 120G8 which is a useful tool to deplete this DC subtype in vivo. Functionally, pDCs are characterized by their capacity to produce high amounts of type - I interferons (IFN-a/b) upon viral stimulation. Unlike conventional DCs which produce IL-12, pDCs have modest antigen-presentation function, their role being rather to link innate and adaptive immunity. In steady- state, pDCs occur in peripheral blood and lymphoid tissue, into which they immigrate via high endothelial venules. pDC undergo further maturation in response to IL-3 plus CD40- ligand, or to the cytokines IFN-a or TNF-a. DC subtypes found in the thymus differ from those in lymph nodes or spleen. Thymic DCs do however express markers such as Langerin/CD207 and DEC205/CD205, that are associated with other DC subtypes. Thymic DCs are involved in shaping central tolerance of the developing T cell repertoire . Finally, follicular DCs, expressing the long-isoform of CR2/CD21, represent a cell - type ontogenically distinct from all other DCs, and found within B lymphocyte follicles of secondary lymphoid tissue. OriGene Technologies offers a vast selection of antibodies for characterizing Dendritic Cells (see Table 1 below). 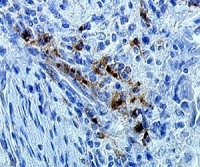 Most of these antibodies are suitable for immunohistochemistry (see figures 1 – 4) and some have been proven to work on paraffin sections. A majority of these antibodies is also available in Biotin- or fluorescence-dye conjugated formats suitable for flow cytometry / FACS. 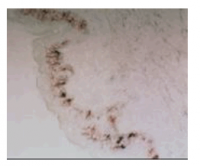 Some antibodies are available in special formats for functional applications. Flacher V, Douillard P, Ait-Yahia S, Stoitzner P, Clair-Moninot V, Romani N, Saeland S. Expression of langerin/CD207 reveals dendritic cell heterogeneity between inbred mouse strains. Immunology. 2008 Mar;123(3):339-47. Pack M, Trumpfheller C, Thomas D, Park CG, Granelli-Piperno A, Münz C, Steinman RM. DEC-205/CD205+ dendritic cells are abundant in the white pulp of the human spleen, including the border region between the red and white pulp. Immunology. 2008 Mar;123(3):438-46. Romani N., Holzmann S., Tripp C.H., Koch F., Stoitzner P., Langerhans cells - dendritic cells of the epidermis, 2003 APMIS 111: 725-740. Gautier G., De Saint -Vis B., Senechal B., Pin J.J., Bates E.E., Caux C., Geissmann F, Garrone P., The class 6 semaphorin SEMA6A is induced by interferon-gamma and defines an activation status of langerhans cells observed in pathological situations, 2006 Am J Pathol 168: 453-465. Valladeau J., Saeland S., Cutaneous dendritic cells, 2005 Seminars Immunol 17: 273-283. Guermonprez P., Valladeau J., Zitvogel L., Thery C., Amigorena S., Antigen presentation and T cell stimulation by dendritic cells, 2002 Ann Rev Immunol 20: 621-667. Liu Y.J., IPC: professional type 1 interferon-producing cells and plasmacytoid dendritic precursors 2005 Ann Rev Immunol 23: 275-306. Wu L., Shortman K., Heterogeneity of thymic dendritic cells, 2005 Semin Immunol 17 : 304-312. 35 products - FILTER YOUR RESULTS!